It’s a typical morning on Deck 11 – hawkers selling their wares, traders and con men trying to earn barter, hypervigilent thugs standing guard, anxious for someone or something to inflict trauma upon. Jackson’s big problem this morning: two scam artists (Skeeter and Trine) are selling bogus, substandard water pumps in the market. Jackson heads over to their stall and shakes them down a bit, but gets distracted by the appearance of Jay, who is heading for the clinic. Jackson intercepts the Angel and tries her usual pick-up lines – finding Jay to be every bit as outwardly unreceptive as usual. Meanwhile, Raven is awakened by the faint smell of burning machine oil and a faint, hot breeze blowing in from one of the ventilation shafts. She checks with a couple of locals (Bob, a local orphan, and Sponge. an old rag picker/embroidery artist) and locates the source of the hot air, then sends Bob off to find Jackson and inform him of the problem. Bob manages to arrive at the perfect time to finalize Jackson’s failure to pick up Jay, and the urchin and the Hardholder go back to meet Raven while Jay opens up the clinic. Raven gives Jackson a boost up to the opening of the ventilation shaft just in time for Jackson to get a face full of fire as a jet of flame shoots from the opening, burning her severely. A hasty evacuation of the area is organized and Jackson heads back to the clinic for treatment. Once Jay heals up Jackson (after a not inconsiderable amount of banter) an expedition is quickly arranged to try to discover the source of the flames and extinguish them. The resident Saavy Head currently being AWOL somewhere out in the wastes, Jackson gets some of her thugs together, and they head to an old, unused hatch leading inwards towards the lower decks. After some trials and tribulations involving fluctuation of the local gravity and an encounter with robot followers of the Cult of Ai, they are able to locate a very large tank of flammable liquid that has been crudely mounted to the air duct. The tank is guarded by two thugs, but these are quickly dispatched by Raven, and the flow of flammable material is cut off (and eventually disposed of down a waste chute). Taped to the side of the tank is an envelope addressed to Jackson containing an old holo of what appears to be people having a party. On the back of the holo is written “Happy birthday dear! Love, Mom”. Returning to Deck 11, Jay discovers that several of the residents who inhaled smoke from the fire have developed high fevers and have fallen into comas (including Bob, Trine, Sponge, and several of the Hyenas who helped with the evacuation). Jay manages to convince Skeeter to pay for Trine’s treatment after promising to save him, and Raven agrees to pay for Bob’s, but there is no one to pay for Sponge’s treatment, and Jackson convinces Jay to treat his Hyenas for free. Those who have fallen ill are moved back into the area where the fire was and quarantined, and the clinic relocates there to treat them. Jay finds the disease to be difficult to treat and those who contract it eventually fall into a stable, but persistent coma. The disease appears to have some sort of specific treatment or antidote, but Jay can’t figure it out. Desperate to save Bob for Raven, Jay eventually comes up with an experimental treatment which is marginally successful, but at the cost of vivisecting Sponge. Bob comes out of his coma, but seems to have lost his volition and most of his skills, being little more than a shambling husk of his former, youthful self. Desperate for any sort of clue that will help him/her defeat the new disease, Jay opens his/her mind to the psychic maelstrom. From the depths and confusion, a single impression rises to the surface – his/her betrayal of Jackson, treatment of Jackson’s mother, and her subsequent escape are not true. The Hardholder: Jackson (played by Alan) – Jackson runs a Hardholding known as Deck 11. It’s a trading and farming community centered around some still-functioning agricultural vats. People come from the surrounding, uncontrolled portions of Ship to trade at Deck 11, which is known as a safe haven for folks to conduct business. It is also known for the barely checked ferocity of its security forces, “The Hyenas”, whom Jackson has, with no little difficulty, been able to transform from a ravenous pack of bloodthirsty maniacs to a disciplined pack of bloodthirsty maniacs. The Angel: Jay (played by Christine) – Jay runs the clinic on Deck 11, a valuable and lucrative enterprise in a world where medical care is a scarce commodity and situations where it is needed are not. Jay’s motto is “always get paid” but often seems to wind up doing medical care for free despite that. In addition to a large supply of chillstabs and medical supplies, Jay also possesses certain abilities that he/she does not understand, such as the ability to heal by touch… sometimes. Jay’s ability to do this is sporadic, and he/she claims to have “killed more people than I have healed this way.” Jay knows Jackson from way back, and during the coup that put Jackson in charge of Deck 11 betrayed her by healing the former Hardholder, Jackson’s mother, and allowing her to escape. The Battlebabe: Raven (played by Sophie) – little is known about the mysterious and dangerous woman known as Raven. Her past is largely a mystery, though it is rumored that she first met Jackson during her time as an exile and fugitive from Deck 11. Aloof and secretive by nature, Raven tends to shun close attachments, looking ahead only as far as the next job, She has only recently returned to Deck 11 after a protracted absence, and is now looking to sell her services as a warrior and bodyguard for hire. The Exodus does not have a magnetic north pole, and the gravity is artificially produced so even if the vessel is under thrust at the moment (which is unknown) there is no way to absolutely determine direction. Nevertheless, there are some fairly common directions which can be used under most circumstances to orient people. Higee – anyplace where you feel heavier than normal. Also, somewhere highly stressful. Logee – anyplace where you feel lighter than normal. Also, under the influence of drugs. Nogee – anyplace where you are effectively weightless. Also, dead. Ai – usually considered mythical, Ai is a disembodied intelligence which sometimes appears to or communicates with certain individuals. Ai is the closest thing that people have to a concept of a deity. Guidance, Guides – any sort of fortuitous circumstance, luck, or situation that turns out well largely due to events beyond the person’s control. If you are the sort of person who considers this to be the intervention of entities, it’s “guides” who help you. Otherwise you received “guidance”. 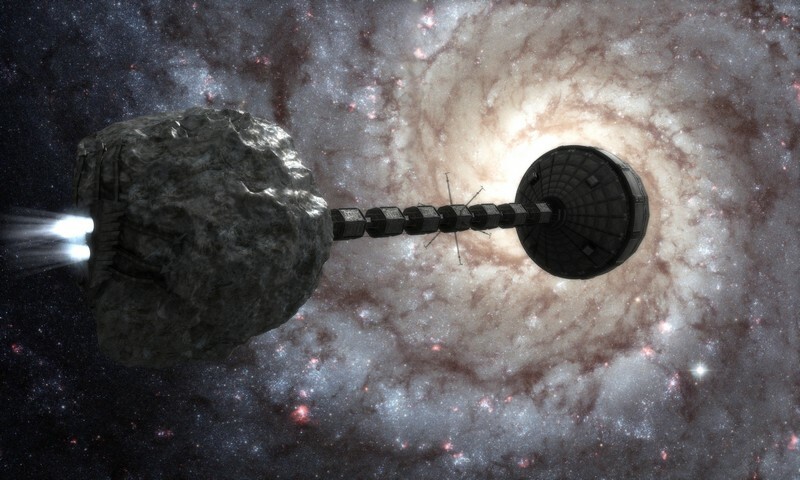 The multi-generation exploration/settlement vessel Exodus was originally constructed in the Oort cloud of the Solar System, around the a nickel-iron/deuterium comet core approximately 20 km across. Engines were build directly into the comet, which would serve both as the primary fuel tank and provide raw materials for hull repair and fabrication during the estimated 400 year journey. A crew of 100,000 was selected. At any given time only a small fraction of these would exist in physical form, the rest stored as computer information in an electronic “dream time” virtual existence. But something went wrong. Exactly what, or when, or where nobody knows. Now, generations later, nobody knows that they are on a ship, traveling at a significant portion of c through outer space. Wars and struggle and decay and damage have reduced many parts of the vessel to only marginal habitability. Ship’s systems have gone feral and unpredictable, and Ai, the closest thing anyone has to a deity, is dead or insane or malevolent. Apocalypse World – Exodus. Coming soon.